Views can be published on a page, post, widget, or even within another View. If you haven't created a View yet, follow the instructions to create a basic View. Select the view that you want to publish, then choose from the options below. You may insert the following shortcode on a page, post, or text widget to display your View. Replace x with the ID or key of the View you would like to insert. You can find the ID or key by going into your View and clicking the 'View Shortcodes' link in the right sidebar. id - ID or key of the View. filter - Use filter=limited to send your View content through the WordPress content filters. You may see shortcodes on the page without this parameter. Another plugin or your theme is already filtering your View. Your View is published inside of another View. entry_id - Display a specific entry in your View. This will override all other filters in your View. user_id - Display entries submitted by a specific user. This parameter accepts a user ID number, not a username, and it will override any UserID filters you have added to your View. limit - Limit the number of entries displayed in your View. This will override the Limit set in the Advanced Settings of your View. page_size - Set a page size for your View. This will override the Page Size set in the Advanced Settings of your View. order_by - Order the entries in your View by a field ID/key or set a random order by using order_by="rand". This will override the Order set in the Advanced Settings of your View. You must use the order parameter in your View shortcode. order - Specify the direction of the ordered entries with order="ASC" or order="DESC". This will override the Order set in the Advanced Settings of your View. drafts - By default, draft entries are not included in your views. 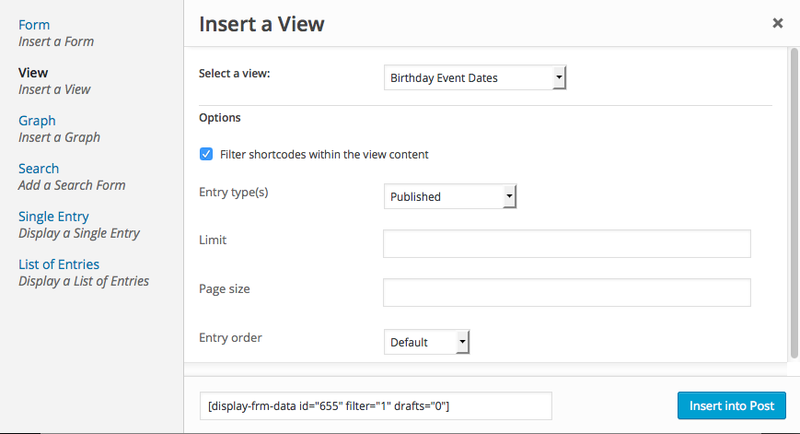 If you'd like to only show the drafts, add drafts=1 to your shortcode. If you'd like to show drafts and non-drafts, use drafts=both. param_name - Pass a value to your View. You may use this value to show specific entries and avoid creating duplicate Views. Put [get param="param_name"] anywhere in your View to display the value. When you pass a value to your View, like this: [display-frm-data id=x my_param="value"], then you can add a filter to your View that sets a field equal to [get param="my_param"]. wpautop - Use wpautop=0 to prevent paragraph tags from being added to Views that include filter=limited. Use wpautop=1 to add paragraph tags to Views. Replace x with ID or key of the View you would like to display. All optional parameters may be used in the PHP call as well.